Be the first to share your favorite memory, photo or story of Anna Jane. This memorial page is dedicated for family, friends and future generations to celebrate the life of their loved one. 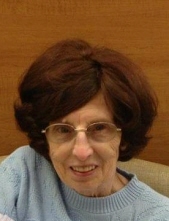 Anna Jane Lovejoy, age 76, of Woodsboro, died Monday, October 15, 2018 at her home. Born September 7, 1942 in Hanover, PA, she was the daughter of the late Lavina Mahanna. She was the wife of Odis Lovejoy who died in 2006. Anna enjoyed sewing, needlepoint, crocheting, making quilts for charities and she loved her dog "Buddy". Surviving are children, Jeffrey Lovejoy of Knoxville, Sandra Jack and husband Paul of Woodsboro, Trudy Smallwood of Martinsburg, WV and Melissa Fellows and husband Dale of Fairplay; 5 grandchildren, Brandon, Christopher, Jessica, Alexander and Curtis; 5 great grandchildren; siblings, Linda Barnes and husband Robert of Taneytown, Regina Eckenrode of Emmitsburg and Michael Eckenrode and wife Kim of Westminster. She was predeceased by a sister, Sharon Brewbaker and brothers, William and Robert Mahanna. A memorial service will be held at 7:00 p.m. Wednesday, October 24 at Hartzler Funeral Home, 404 S. Main St., Woodsboro. The family will receive friends at the funeral home from 6:00 p.m. until service time. Private interment will be in Union Cemetery, Keysville at a later date. In lieu of flowers memorial contributions may be made to your local humane society or your local hospice. To send flowers or a remembrance gift to the family of Anna Jane Lovejoy, please visit our Tribute Store. "Email Address" would like to share the life celebration of Anna Jane Lovejoy. Click on the "link" to go to share a favorite memory or leave a condolence message for the family.